(Newser) – Marco Polo's travels to China in the 13th century are the first well documented record of a European reaching the empire. But archaeologists studying a famous trove of terracotta figures dug up in China now suggest that the first contact with the West occurred much earlier than thought—some 1,500 years before Polo's arrival, reports the BBC. Their theory is that those terracotta figures were inspired by Greek art, and that a Greek sculptor may have actually helped create them around 300 BC. 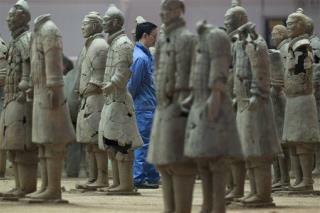 For one thing, there's nothing in earlier Chinese art like these life-sized statues. “I imagine that a Greek sculptor may have been at the site to train the locals," says historian Lukas Nickel of the University of Vienna. But more than that, researchers have turned up European DNA from skeletons at a nearby site in northern China. Way before Marco Polo's travels to China during 13th century, the Chinese had well documented embassies sent to the Rome first Emperor, Augustus. It happened at about the time of birth of Jesus Christ, me not believing Jesus had anything to do with, but simply coincidence. The 2nd-century AD Roman historian Florus describes the visit of numerous envoys to Rome as such: "Even the rest of the nations of the world which were not subject to the imperial sway were sensible of its grandeur, and looked with reverence to the Roman people, the great conqueror of nations. Thus even Scythians and Sarmatians sent envoys to seek the friendship of Rome. Nay, the Seres came likewise, and the Indians who dwelt beneath the vertical sun, bringing presents of precious stones and pearls and elephants, but thinking all of less moment than the vastness of the journey which they had undertaken, and which they said had occupied four years. In truth it needed but to look at their complexion to see that they were people of another world than ours. Roman historian Florus" Seneca the Younger (c. 4 BCE– 65 CE) famously decried the transparency of fine silk as dangerous since it made the married women who wore it seemingly alluring and available to all comers. “ I can see clothes of silk, if materials that do not hide the body, nor even one's decency, can be called clothes. ... Wretched flocks of maids labor so that the adulteress may be visible through her thin dress, so that her husband has no more acquaintance than any outsider or foreigner with his wife's body.” So, just how and why is the terra-cotta Army even relevant in proving that West and East had officially met at least 2 000 years ago? And knowing the nature of our brethren, would it be a stretch of imagination to believe, that Chinese and European merchants had long before the above mentioned envoys and historians, already traveled the distance in pursuit of riches?